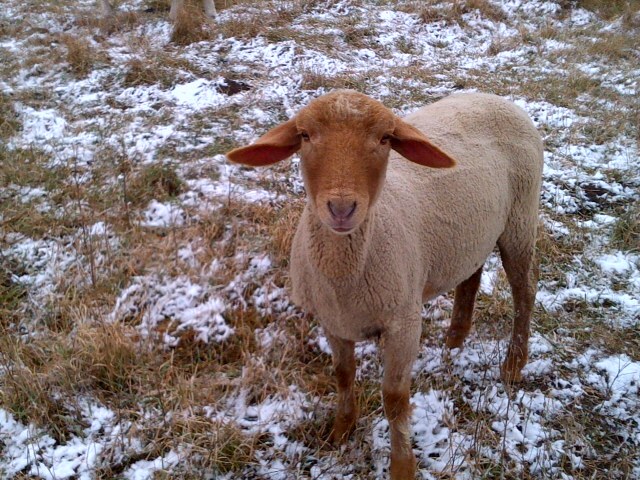 We purchased two registered Tunis rams and a yearling ewe from Sandstone Ridge Farm near La Farge, Wisc., this fall. They arrived this weekend to do their business to ensure our ewes lamb in the spring. The Tunis breeds are a heritage breed originally imported in 1799 and were highly regarded by prominent Americans such as John Adams, Thomas Jefferson and George Washington. They are featured on the Slow Food Arc of Taste , a catalog of more than 200 delicious foods in danger of extinction. Heritage Tunis sheep in danger of extinction. Our rams arrived in November to do their part to keep the breed alive. According to Slow Food, the Tunis sheep is striking and attractive with cream or ivory-colored wool that is set nicely contrasted by a cinnamon-red face and legs. Spinning, anyone? Their pendulous ears and expressive eyes give a quizzical aspect to their demeanor, which is correctly interpreted as calm and docile. The meat is known to be tender and flavorful without a strong mutton taste. Grab your rosemary and olive oil.